Must Read: Data Breach Reviews 2016. A wide range of attacks are associated with the term hacking. Some are amazingly complex and demand a high degree of knowledge, others are even easier than installing some software to a specific device. One of the most common hacks is also one of the toughest to defend against. Which is known as a fake Wi-Fi access point? Hackers use this simple trick to easily steal data of innocent wireless users in public places. Must Read: How can an online hack steal your password. 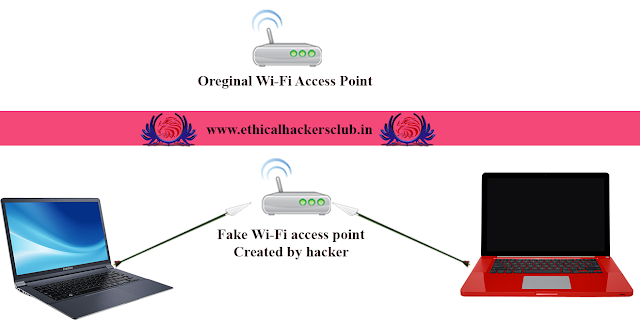 What is a fake Wi-Fi access point data theft? Such attacks have a number of names associated with it: AP Phishing, Wi-Fi Phishing, Hotspotter, Evil Twins, and Honeypot AP. All of these are linked with creating a fake Wi-Fi connection that people log into, and whose goal is to steal credentials, logins, and passwords. Must Read: Join EHC committee and get recognized . No matter which apps is used, the aim is to set up a wireless connection that people will wish to connect. And will surely connect to the wireless point they likely won’t suspect at all. Why? Because this tactic is used most often in public areas. If you were to go into your local McDonald, sit down with your Meal and open up your Smartphone, tablet, or a laptop finding a connection labeled ‘McD Free WiFi,’ you’d probably connect it. That’s what the hackers are counting on. Your lack of intelligence. Must Read: EHC Committee Members . How Does A Hacker Steal Your Data When You Use Fake Wi-Fi? Your data is not exactly stolen, yes you read it correctly, Actually, you Spit it out. A large percentage of these hacks take place with a fake wireless point that requires a login and password. Once that information is put into the login, hackers will take it and use it to sign into popular websites, assuming that you use the same login and password for multiple sites. Must Read: Is Your Phone Hacked? There are numerous steps to defend against Such attacks. The best act of defense is to get verification from the wifi provider. Ask the McDonald staff which exactly is their wi-fi, it can save you from a massive headache. Always remember "if a deal seems too good to be true" it probably is. Use anonymous (different) login ID's and passwords for public Wi-Fi. Never use the auto-connect feature to stay protected from Malicious open Wi-Fi. Be cautious when connection suddenly disconnect, especially if it happens to everyone on the network. An app known as aireplay has the ability to disconnect users from wifi, hoping that they’ll reconnect to their fake wifi. Be cautious of certificates. Good websites can occasionally send you one, but if this happens over a public wifi that you don’t know, it is best to ignore such connection. If a wifi hotspot is interfering with your VPN, forcing you to shut it down, that is a HUGE RED LIGHT. A VPN is a great defense against this attack, and hackers understand it. Forcing your VPN to disable when you’re trying to connect is the only way that they can steal your data. The last point I would add is that a VPN can be a great defense against this type of attack because it encrypts all of the data that you send out. With this data being encrypted, even when you create your login and password with the fake wi-fi, your data can not be stolen because it can not be read. We continuously test and review Top 10 VPNs on our website if you’re interested in learning more about them. A last option that I’ll suggest is using SSL-protected apps. These do take more care, but they will offer you the protection which is similar to a VPN. Some hackers have even found a way around SSL protection ( the BREACH method), so you may want to explore using this with a secondary defensive measure. The overall advice is to be cautious and verify before you connect. People look at me weird all the time when I ask for the correct wifi name that I should use to connect to. I can easily take those looks as I have never been victimized to such evil twin Wi-Fi Networks. My Privacy is much more important than those looks.